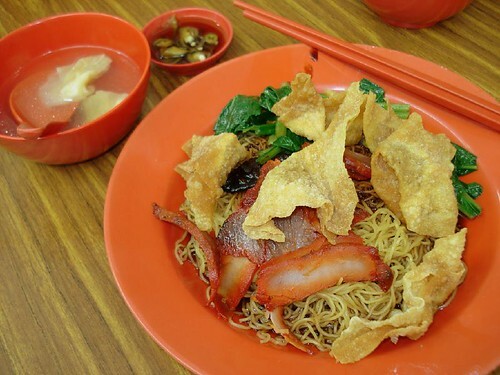 Parklane Zha Yun Tun Wantan Noodles, originally uploaded by Camemberu. This is from the North Bridge Road branch (opposite Bugis junction, between Liang Seah Street and Middle Road). My second time eating their noodles (first time round was sheer disappointment). Since hubby says he likes them, I gave them another try. In fact, I tried the upsized version S$4 instead of the S$3 previously. Hmm, a little better. The highlight is really the crispy dumplings, tasty despite being more wantan skin than meat. 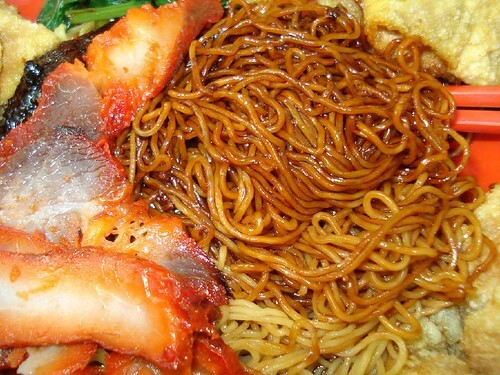 The char siew is fine too, at least it's not the thin slices of superdry flavourless meat dyed red. The noodles are all right, done to QQ consistency but the sauce is where it falls flat. While the dish looks good, something is sorely missing. It just does not have that umami oomph. If only they used better stock as a base...or whatever it is that goes into really good Malaysia/KL-style wantan noodles. So, in conclusion...go for the S$4 serving if you're having it at all. But still, don't expect to be completely satisfied.